BARBERINO VAL D’ELSA, TUSCANY— There have probably been times in my life that I thought that I understood “sacrifice.” There might have been times I even thought I made sacrifices. Those times probably had to do with the loss of certain creature comforts, or— more than likely— a lack of material things during leaner times. What I know today is that I have probably never really known true sacrifice in the purest sense and have only come to understand the depth and breadth of it in recent years. True sacrifice comes in many sizes, colors, and situations. Today I am grateful for the sacrifices made by American soldiers during World War II, especially those who lost their lives in the Italian campaign. My friend, collaborator, and business partner— the watercolorist— Wyatt Waters, and I have been in Tuscany for over three weeks leading three separate groups of 25 Americans each through this beautiful part of the world. Our tours are a total immersion into Tuscan food, art, culture, architecture, and personalities. We cover a lot of ground in a week. I tell the groups, “We are going to do two weeks of Tuscany in one week,” and it’s true. Though the favorite part of the trip for Waters and me has nothing to do with Italian food, art, or culture. It’s our visit to the Florence American Cemetery. I couldn’t have been more wrong— or more insensitive. Two years ago, during our guest’s free day. Waters and I were driving through the Tuscan countryside trying to find a place or setting he might want to paint. We were near the cemetery I had so uncaringly passed all of those years, and finally said, “Let’s just pull in there and check it out.” It’s not an overstatement to say that pulling into the cemetery that day changed my own life on several levels. I vowed to never pass an American war cemetery ever again, without stopping and paying my respect. If you have never been to a cemetery operated by the American Battle Monuments Commission, you have missed out. If you have only been to Normandy, and none of the others, you have still missed out. The American Battle Monuments Commission is a governmental agency operated out of the executive branch and maintains all of our overseas cemeteries from World War I and World War II. Our country may get a few things wrong, but one of the things we truly get right is how we own and operate these sacred places where we bury and honor those who have sacrificed in defense of our freedoms. The Florence American Cemetery is one of two WWII cemeteries in Italy. The Sicily-Rome Cemetery covers those who lost their lives in the southern part of the country— using Rome as the dividing line— and The Florence American Cemetery covers the northern half of Italy. Over 4,300 soldiers are buried there, and the wall of the missing lists another 1,409 soldiers. It is 70 acres of American pristinely manicured soil, just a few miles outside of Florence, and completely owned and maintained by the United States of America. When Waters and I first visited we were greeted by the superintendent, Angel Matos, a retired naval officer from New York, whose first military assignment was in Gulfport, Mississippi. Matos lives on the grounds and is the ultimate ambassador for his country, his agency, and those buried in his cemetery. While Waters completed a watercolor of a statue on the grounds, Matos gave me a full tour of the cemetery. Only one-third of those who were killed in combat in the northern half of the Italian campaign are buried there. The other two thirds were sent home to be interred in Arlington or in their hometown. Among the more than 1,400 listed on the wall of the missing, most were Army air corps who were lost flying missions over the Adriatic. You will be proud to know that your country is still looking for, finding, and identifying those soldiers missing in action. The Italian campaign was brutal and is overlooked by many as the liberation of Rome was on June 5th, 1944, the day before the Normandy beach landing. But there were three landings in Italy prior to that, and the Germans had built a defensive line of manpower and weaponry— The Gothic Line— that was five miles deep and stretched the entire width of Italy through the Apennine Mountains. At the end of the day of that first cemetery visit, Waters and I met at the base of the flag after he finished his painting. As it does every day, “Taps” began playing in the distance. As it was being lowered, Matos asked if we would like to fold the flag. It was one of the most meaningful moments in my life. 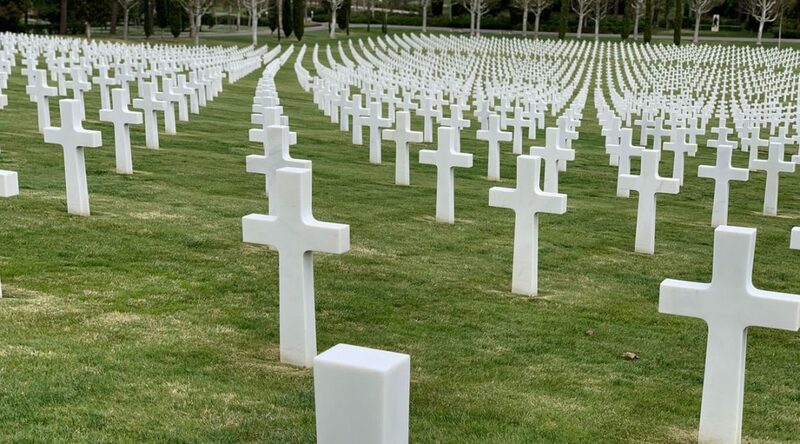 As we tucked the final corner of the flag into the tight triangular pocket we had created, I vowed to do two things: Take our group— and every other group thereafter— to this sacred place, and to never, ever, pass another American war cemetery without stopping and paying my respects. Many times when we have visited I have encountered Italian citizens who are also there to pay their respects for the sacrifices made by young American men and women— some as young as 17, with an average age of 22— who volunteered to travel to a country halfway across the globe to liberate people they had never— and would never— meet from an evil and tyrannical madman. Waters’ father fought in the Italian campaign, but never spoke of it to his son, or anyone in the family. As many in that generation did, he just came home and went to work. Matos looked up Mr. Waters’ war record and discovered he had been awarded the Bronze Star. The family members never knew. Fortunately, he made it home. There are 64 Mississippians buried in the Florence American Cemetery. 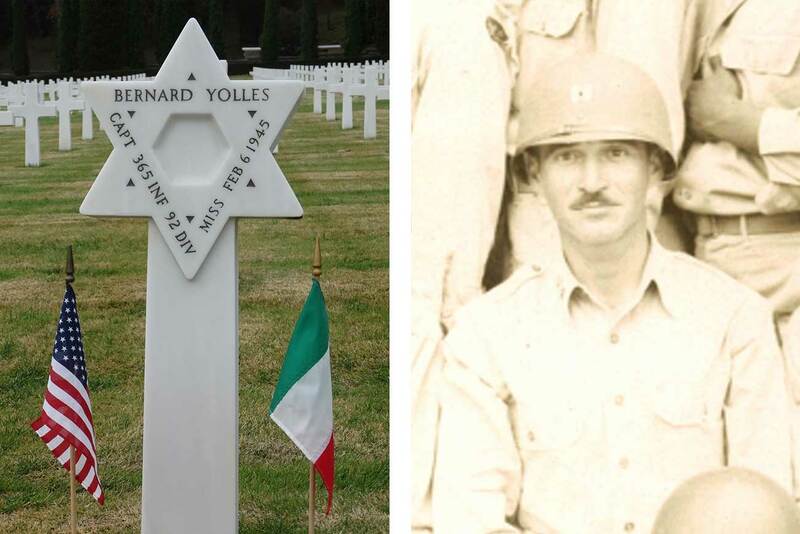 One of them is U.S. Army Captain Bernard Yolles from Winona. A Purple Heart recipient who left his family’s department store business, a wife, and baby daughter behind to volunteer for service when he was 24-years old. Yolles, a member of the only Jewish family in Winona at the time led an all African-American division of Buffalo Soldiers into battle. A Jewish Captain from Mississippi, leading an all-black division in an army that was segregated at the time— his is an amazing story, and just one of over 4,000 stories that need to be told at the Florence American Cemetery. We always tell our guests the story of Captain Bernard Yolles and give them some backstory on his life in Winona before the war. I also ask guests to stop by another cross or Star of David on the grounds for a minute and say a short prayer of gratitude to that soldier. It might be the only time anyone ever visits that particular grave. Today I am feeling grateful that I know the meaning of sacrifice and am in awe and humbled by those Americans who paid the ultimate sacrifice in World War II.